I've always been fascinated by lurid accounts of historical murders, and luckily, Britain has no shortage of those. 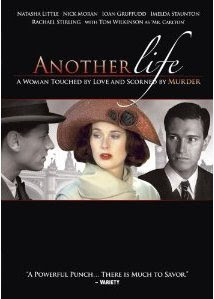 I was familiar with the case of Edith Thompson, hanged in 1923 for the murder of her husband, but I had no idea the story had been the basis for a fairly recent film, 2001's Another Life. The case has always fascinated me, mainly because the accounts of the story I've read always seem to indicate that Edith was unjustly executed. I'm not sure how much poetic license was taken with the film, but I have more questions after seeing it. Edith Thompson was portrayed in the film as a high-spirited, fun loving girl. She giggled and twirled her way through life. A thoroughly modern woman, she had a good job as a book keeper at a hat store, and flirted outrageously with her boss, portrayed by a sympathetic Tom Wilkinson. The true tragedy in the story was when the spunky Edith married dull, stodgy, old-before-his-time Percy Thompson. Percy was an accountant, and the son of a right sour-faced old cow (sorry, the Eastenders influence sometimes overcomes me!). World War I is approaching, and no doubt the romance of a possibly permanent separation helped to speed up the wedding. It turns out that Percy had a "bad ticker" that kept him out of the war. He was so pleased to be avoiding the conflict, and so eager to give others advice on how to fake a "dodgy ticker," that Edith lost what little respect she'd had for him. She also earned more than he did, which also served to increase her contempt for him. Enter Frederick Bywaters. Edith's family knew Freddy as something of a neighborhood thug in his youth. He's grown up now, although Edith is still nearly a decade his senior. Freddy works as a sailor and is frequently gone on to sea, which no doubt only increased his romantic appeal -- visiting all those exotic ports of call, while poor Edith was stuck living in Ilford with boring old Percy. Although Edith's unmarried sister Avis is interested in Freddy, he and Edith begin a long and torrid affair. At first, Freddy lives with the Thompsons when he's not at sea. It doesn't take long for Percy to suspect that something is going on with his wife and their young lodger. Freddy is banished, but he and Edith continue their relationship. While he is at sea, they being a long and torrid correspondence. This is where Edith gets into trouble. Although she is very modern in her views, she is opposed to getting a divorce. She is worried about what the neighbors would think, and she also states that she would lose her job as a divorced woman. So she convinces Freddy to continue their relationship as it is. This continues for a while, but she eventually grows so tired of Percy that she asks for a separation. This Percy adamantly refuses to grant, although he seems to be fully aware that his wife is carrying on an affair (she comes in late most nights when Freddy is in town). It is at this point that talk of murdering Percy surfaces. Freddy is apparently serious about the idea, but, as portrayed in the film, Edith goes along with the idea only in theory. She cheerfully writes to Freddy about her attempts to poison her husband, first with ground glass in his food, and later with powders Freddy sent her to induce an abortion. Did she really try to kill Percy? I guess that is where the true question of the case lies. Certainly, in the film she's shown dropping light bulbs, sweeping up glass, and watching intently as Percy eats. Who's to know? One evening, after Freddy has pressed her to once again leave her husband, Edith states that she and Percy are going to the theatre that night. As they return home, an assailant jumps out of the bushes and stabs Percy to death. Freddy is quickly caught, and there's really no attempt on his part to deny guilt. Edith is arrested as an accomplice, although she denies all knowledge of the murder. Naturally, the police have her letters, which seem to admit to numerous prior attempts on her husband's life. It was also interesting to see the actual execution scene. I wonder how true to life it was? In the film, Edith becomes hysterical and has to be drugged. She is then carried, more or less unconscious, to the gallows. Of course, for her sake, I hope that part at least was accurate! Many believe that Edith was executed, not for murdering her husband, but for the sin of being a married middle class woman who committed adultery. I must admit that I didn't have any doubt of her innocence before I saw all of her "joking" about trying to kill her husband. The final credits of the film contained the information that the files from the case were sealed for 100 years, which means they should be open for inspection in 13 years. It will be interesting to see if any new revelations come to light when that happens. I heard about that case not too long ago. On your recommendation I think I'll put the film on my netflix list. Thanks. Hope you enjoy it! It's only about an hour and a half long, so just about right. Quite an interesting story!